We had an absolutely beautiful night for Halloween this year– maybe in the fifties, clear skies, no wind, etc. And as a result, we had lots and lots of trick and/or treaters. Ours is a neighborhood that always gets a lot of trick and/or treaters, and this year we ended up giving away about 750 pieces of candy. Cheap candy, I should point out– we get big bulk bags from Costco of Tootsie Rolls, Smarties, Laffy Taffy, etc. I felt kind of bad. Andre and Dickish McBastard (et al) stopped by and tried trick and/or treating for beer, and I balked. I only had a couple left, guys. I owe you a couple at the Corner or something like that. Interestingly, Will got to a point where he decided it was more fun to give out candy than to actually trick and/or treat himself. So Will sat in the chair I was in for much of the night in the front yard (like I said, it was a beautiful night) and lorded over the candy while Annette and I sat on the stoop and drank wine. An excellent Halloween indeed. 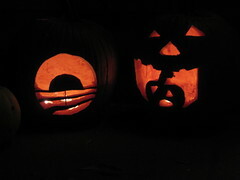 By the way, I received many compliments on my Obama pumpkin. I’m going to take this as a good sign for Tuesday. 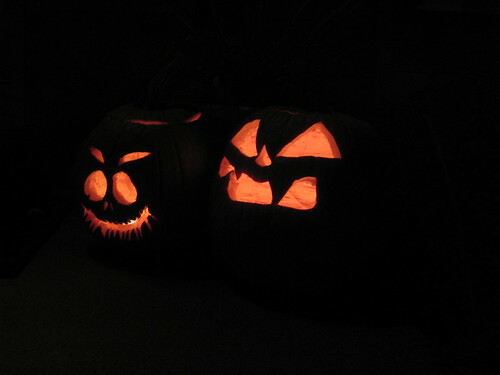 The pumpkin on the right is one that Will carved at school with his “senior buddies,” which is a program at Greenhills that pairs up sixth graders with 12th graders for various activities, like carving pumpkins. This is a pumpkin eating a pumpkin, which was Will’s idea and one that got from a FoodTV show we were watching the other night. You don’t owe us beer… we were just kidding around. I loved the Steve costume, by the way.